EFFIPRO® SPOT-ON SOLUTION is an effective topical spot-on used for the treatment and prevention of ticks and flea infestations in dogs. What is Effipro spot-on and who is it for? EFFIPRO® SPOT-ON SOLUTION contains fipronil, a substance that kills fleas and ticks. 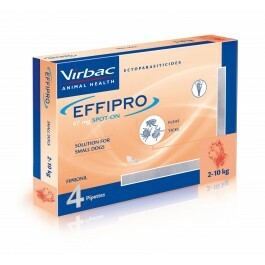 EFFIPRO®can be used for the prevention and treatment of flea and tick infestations, and as part of a treatment strategy for Flea Allergy Dermatitis (FAD), where this has been previously diagnosed by a veterinary surgeon. The new EFFIPRO®SPOT-ON pipette has been designed to give complete control to pet owners when applying the product, with a unique Drop-Lock technology. EFFIPRO® stays locked away until a little gentle pressure is applied so no matter how many times you have to put it down to get a better hold of your pet, the product stays in the pipette until you and your pet are ready. The most up to date Summary of Product Characteristics for this authorised veterinary medicine can be viewed here. Please Note: We may need to contact you for some additional information about your pet, before we can dispense this medicine. What is the active ingredient in Effipro spot-on? The active ingredient in EFFIPRO® SPOT-ON is Fipronil, an insecticide and acaricide. What does this ingredient do? Fipronil causes uncontrolled activity in the central nervous system (CNS) of insects or acarids, resulting in their death. Fleas (Ctenocephalides spp) are killed within 24 hours of application. Ticks (Rhipicephalus spp, Dermacentor spp, Ixodes spp. including Ixodes ricinus) will usually be killed within 48 hours of contact with fipronil. However, if Rhipicephalus sanguineus and Ixodes ricinusticks are already present on the animal when the product is applied, they may not be killed within the first 48 hours. The solution is indicated for cutaneous (skin) administration. Box containing four 0.67ml pipettes. What is in Effipro spot-on? How do I use Effipro spot-on? 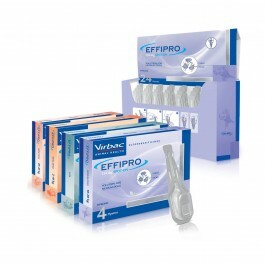 1 pipette of EFFIPRO® SPOT-ON 0.67 ml per dog weighing over 2 kg and up to 10 kg bodyweight. The product has a persistent insecticidal efficacy for up to 8 weeks against fleas (Ctenocephalides spp). The product has a persistent acaricidal efficacy for up to 4 weeks against ticks (Rhipicephalus sanguineus, Ixodes ricinus, Dermacentor reticulatus). If ticks of some species (Rhipicephalus sanguineus and Ixodes ricinus) are present when the product is applied, all the ticks may not be killed within the first 48 hours but they may be killed within a week. For optimal control of flea and/or tick infestation the treatment schedule can be based on the local epidemiological situation. Ask your veterinary surgeon for advice based on your geographical location and flea/tick risk. Hold the pipette upright. Tap the narrow part of the pipette to ensure that the contents are within the main body of the pipette. Break the snap-off top of the spot-on pipette along the scored line. Part the pet’s coat until its skin is visible. Place the tip of the pipette directly against the bared skin and squeeze gently several times to empty its contents. Repeat this procedure at one or two different points along the dog’s back. Care should be taken to avoid excessive wetting of the hair with the product since this will cause a sticky appearance of hairs at the treatment spot. However, should this occur, it will disappear within 24 hours post application. White deposits may also be seen at the site for up to 48 hours after application. In the absence of available data, the product should not be used on puppies less than 2 months old and /or weighing less than 2kg. Do not use in cases of hypersensitivity to the active substance or to any of excipients. Shampooing an hour prior to treatment does not affect the efficacy of the product against fleas. Avoid contact with the animal’s eyes. In the case of accidental eye contact, immediately and thoroughly flush the eyes with water. Use in pregnancy and lactation only in accordance with professional veterinary advice and a benefit/risk assessment. In the case of accidental eye contact, immediately and thoroughly flush the eyes with water. If eye irritation persists seek medical advice and show the package leaflet or the label to the physician. Avoid contents coming into contact with the fingers. If this occurs, wash hands with soap and water. Wash hands after use. People with known hypersensitivity to fipronil or excipients should avoid contact with the veterinary medicinal product. The alcohol carrier may have adverse effects on painted, varnished or other household surfaces or furnishings. The product should not enter water courses as this may be dangerous for fish or other aquatic organisms. Dogs should not be allowed to swim in water courses for 2 days after application. Do not contaminate ponds, waterways or ditches with the product or empty container. If licking occurs, a brief period of hypersalivation may be observed due mainly to the nature of the carrier. Among the extremely rare suspected adverse reactions, transient cutaneous reactions at the application site (squamosis, local alopecia, pruritus, erythema) and general pruritus or alopecia have been reported after use. Exceptionally, hypersalivation, reversible neurologic symptoms (hyperesthesia, depression, nervous symptoms) or vomiting have been observed after use. If any adverse reactions are noted, they should be reported to your veterinary surgeon. 1ère avenue – 2065 m – L.I.D. Is there any further advice I should know about Effipro spot-on? Fleas from pets often infest the animal's basket, bedding and regular resting areas such as carpets and soft furnishings which should be treated, in case of massive infestation and at the beginning of the control measures, with a suitable insecticide and vacuumed regularly. Re-infestation from emergence of new fleas in the environment may continue to occur for six weeks or longer after treatment is initiated. More than one treatment may therefore be required, depending on the level of fleas in the environment. Bathing/immersion in water within two days after application of the product should be avoided. Weekly immersion in water for one minute reduces the period of persistent insecticidal efficacy against fleas by one week and therefore it is advisable to avoid frequent swimming and shampooing. When used as part of a strategy for the treatment of Flea Allergy Dermatitis, monthly applications to the allergic patient and to other pets in the household are recommended. For optimum control of flea problems in a multi-pet household, all dogs, cats and rabbits in the household should be treated with a suitable insecticide (DO NOT use fipronil-based products on rabbits). CAPSTAR 11.4 mg for cats and small dogs (between 1-11kg)is an oral first step treatment of flea infestations. FLEVOX® SPOT-ON SOLUTION kills fleas, biting lice, and ticks in dogs. FLEVOX® comes in unique single pipette packs so it is easy to buy as many or as few as you require. Frontline Plus Spot-on solution is an easy to use, double action treatment and preventative for flea and tick infestations in dogs. DRONCIT® is a tapeworm treatment for cats and dogs that is effective against all of the common species of tapeworm infecting dogs and cats in the United Kingdom and Ireland. INDOREX® is an odourless, easy-to-use environmental flea treatment which kills adult fleas and house dust mites as well as preventing the development of flea eggs and larvae in the home. PANACUR® Granules are a broad spectrum anthelmintic for the treatment of domestic dogs and cats infected with immature and mature stages of roundworms of the gastro?intestinal and respiratory tracts. PANACUR® Granules are odourless and tasteless and are readily consumed by animals. PANACUR® Paste for cats & dogs is a broad spectrum anthelmintic for the treatment of domestic dogs and cats infected with immature and mature stages of roundworms of the gastro?intestinal and respiratory tracts. PANACUR® Paste is ideal for dosing weaned puppies and kittens, and small adult cats and dogs. DRONTAL® is a broad spectrum wormer that kills every type of intestinal worm commonly found in UK cats and dogs (roundworm, hookworm, whipworm and tapeworm). Cazitel Plus tablets treat mixed infections in dogs caused by tapeworms, hookworms and whipworms.